It has been six months since I’ve written. I was homeschooling our girls this past school year, due to our relocation to Maine. We bought a new house that is about 25 minutes from the ocean, so we moved and have been settling in. Also, in any free time I’ve had, I’ve been digging in to Christian theology & doctrine and Church history. I’ve been reading books by John MacArthur, R.C. Sproul, and a classic by Jonathan Edwards. Great material as I’ve been refining more specifically what I believe and why. Currently, I’m preparing to homeschool our oldest daughter again this year. She has dyslexia, or some kind of slight learning disability, and is still a bit behind. So I am going to work with her one-on-one this year and see if we can get her caught up to her peers, or at least closer. We’ve registered our other two girls back in school, so we’re rounding up supplies, planning lunches, getting the bus route figured out, and will be going to meet the teachers the week before school starts. They don’t start until September 6th, so a couple more weeks of summer. I’m going to be teaching a class for the 5th/6th graders at our homeschool co-op this fall. It’s going to be creative writing, along with an introduction to what blogging is and Internet safety. Around the house, I’m sanding, priming, and painting a dining set we got from someone on Craig’s List. It’s a round, expandable table and seven chairs. My goal is to get it done by Labor Day! My list also includes getting a kitchen cart that can be used for more storage/counter space, either along a wall or as an island. I’d also like a desk or table, along with some shelves to put containers for hanging files to keep all my stuff organized. We’re plugging into a new church and meeting people there. And I am a new regular contributor on another blog: Satisfaction Through Christ. I’ll be posting there twice a month. The ladies who write there are great women who love Jesus, and I’m so humbled to be part of ministering with them. See below for an excerpt and link to visit STC and read the article. Our family traveled down to our hometown in PA for my husband’s 20th high school reunion at the end of July. The kids and I stayed there for two weeks after that to spend time with family and friends. It was a great time! We went camping, swimming, kayaking, to movies, horseback riding, to an amusement park, to a picnic, and school shopping. It was jam-packed with fun! This is a season of new beginnings. We’ve been in Maine for a year, but we’re still in the midst of new beginnings. 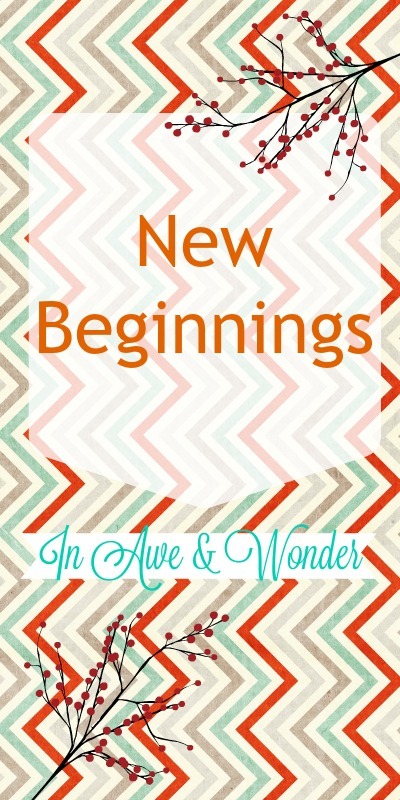 New home, new neighborhood, new school and school year, new church, new writing opportunity, and new look on the blog. I’ve decided to call this space, “In Awe & Wonder.” This blog is a ministry for women, proclaiming the Gospel of grace, proclaiming the Truth of Jesus, giving glory to God, studying the Word, and topics on Christian living. I want to discuss Numbers 11 with you. It stood out to me in my Bible reading. In my Bible, this chapter is titled, “The People Complain.” I will go along and outline what happened, but I encourage you to go to your own Bible and read that chapter for yourself. This event takes place as Moses is leading the Israelites out of slavery in Egypt. But even then after they are freed, with their basic needs being met by God, they begin complaining…again. As if complaining itself isn’t bad enough, they dare to whine and cry that they wish they were back in Egypt…as slaves! …Click over to Satisfaction Through Christ to read the rest of the article. Beautiful new blog. Looking forward to more.